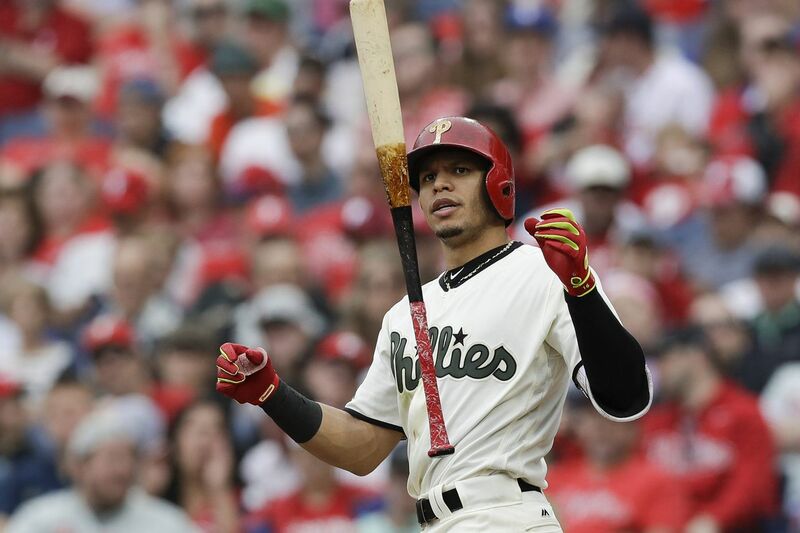 Phillies Cesar Hernandez tosses his bat after striking out swinging. Baseball has always been a sequence of pleasant lulls interrupted by brief bursts of action, and the deliberate, even sedentary, pace of the game as it meanders toward nine innings of play is part of its inherent charm. If watching infielders lean almost imperceptibly as they anticipate a fastball or a breaking pitch, noticing the nervous flick of a pitcher as he shakes off a sign, appreciating the subtle interplays between nine fielders and the batter – all the things that take place when nothing is taking place – if that doesn't hold your attention, I have always thought, then go watch jai alai or something. Now, however, the delicate balance between lull and action seems out of whack and the game is struggling to right itself. This season, for the first time in major-league history, there will likely be fewer hits than strikeouts, and that might serve as a metaphor for an entire sport that is seeing its enjoyable aspects overtaken by its drawbacks. Going into the all-star break, there have been 24,314 hits this season and 24,537 strikeouts. Last season, nine teams had fewer hits than strikeouts, including the Phillies. This season, that number has jumped the median strip of baseball's quiet highway, and there are 16 teams on that side of the road. Numerous factors are conspiring against baseball, but none of them is external. The way the game is played has changed from the inside, although with direction from analysts and strategists whose opinions would have been ridiculed not that long ago. Who could have argued that having a starting pitcher capable of going deep into a game, even pitching a complete game, was a potential drawback? Who could have imagined that using an exaggerated shift was still a good idea even if it yielded easy base hits or unfieldable bunts the other way? Who would have encouraged pitchers with excellent fastballs to rely more on their off-speed pitches even if the result was deeper counts and more walks? And who would have coached hitters to change their swing planes and their batting approaches so substantially that the only predictable results were home runs and strikeouts? The Phillies’ Odubel Herrera strikes out swinging against the Astros. It has all happened, though, and for the very good reason that the numbers prove out. There is no percentage for a hitter to merely reach first base. There is no particular penalty for a pitcher who limits him to that. Over the course of time – and one thing a baseball season has is plenty of time – the task of getting the runner from first to second, second to third, and third to home will collide with the barricade of doing so before there are three outs. Risking one of those precious outs for a steal attempt, or a sacrifice, or a hit-and-run try, the timeless "small ball" that made baseball strategy worth debating from the stands, does not yield long-term returns. If a fan turns to another now and says, "What do you think they'll do here?" the most logical response, regardless of the situation, is "I think everyone will stay where they are and they'll try to hit a home run." Earl Weaver managed the Orioles in a similar fashion 40 years ago – God, that man hated the sacrifice – but his mantra of "pitching, defense and three-run home runs" was an outlier. Even Weaver wouldn't recognize the extremes to which his basic philosophies have been taken, and as for the pitching, selling him on the value of a fresh arm attached to a mediocre pitcher compared to a slightly tiring arm attached to a star would have been difficult. That, however, is where baseball's mathematical predictions have been most accurate. The pitchers are ahead of the hitters. Both the number of pitchers per game and pitches per plate appearance are at an all-time high this season; the time of game, not surprisingly, has again crested three hours per nine innings despite the commissioner's best attempts; and home runs — along with most other batting measurables — are down. Last season, there was one home run for every 6.57 strikeouts. This season, it is one home run for every 7.47 strikeouts, and at this pace, there will be 577 fewer homers hit than in 2017. Put it all together and the game is being played much more intelligently — the analytics bear that out — but it is also very often unwatchable, and, in an observation that is hard to quantify, just not as much fun. It is like playing Scrabble with someone who knows all the two-letter words. It's the smart way to play, and probably the straightest line to success, but, man, it can be annoying. Meanwhile, the Phillies are winning their division, so what's the problem? It isn't because of their own slugging advances – they'll hit just about as many home runs as a year ago when they lost 96 games, and their OPS of .709 is ninth-worst in baseball – but because they have shaved seven-tenths of a run from their team earned run average. As much as any team, the Phils' pitchers are used in keeping with the theories of employing fresh arms and pitching away from contact. Home runs and walks are down. Strikeouts are up. Sure, the talent is better and it's a combination, but the strategies are working, too. The fact is that the Phillies are playing good 2018 baseball right now, and they are being rewarded for that. So, why doesn't it look like good baseball?